Description / Abstract Agricultural intensification has resulted in the transformation of large regions of the central coast of California from diverse native habitat to structurally and taxonomically simplified landscapes of homogeneous cropland. The loss of vegetative diversity and increased use of agrochemicals characteristic of intensified agricultural processes has negative effects on many species and decreases biodiversity. Insectivorous bats are important species in agricultural landscapes that provide biological control of insect pests, but are also vulnerable to the detrimental effects of agricultural intensification. Due to variations in echolocation call design and morphological adaptations of different bat species to a diversity of habitats, some species may be more sensitive to agricultural intensification than others. 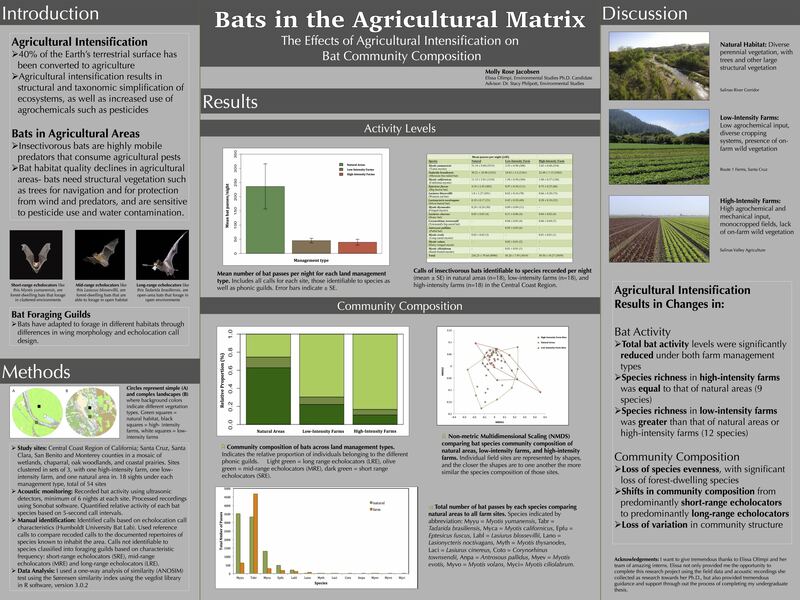 In this study I examined the differences in bat community composition in two agricultural habitats differing in agricultural intensification and in a nearby natural habitat. I used acoustic monitoring to examine bat activity levels and species composition at 18 sites under each management type, comparing (1) natural habitat to that of (2) low-intensity farms with low agrochemical input and high vegetative diversity, representing complex agricultural habitats and (3) high-intensity farms with high agrochemical and mechanical input and low vegetative diversity, representing simplified habitats. Bat activity levels were significantly lower under both farm management types as compared to natural areas. Species richness was highest in low-intensity farms, and lower in natural areas and high-intensity farms; however, species evenness declined markedly under both farm management types, compared with natural habitats. I observed a significant loss of vulnerable forest-dwelling species and increased abundance of generalist open-area species in farms compared with the natural habitats. These findings highlight the importance of conservation of on-farm natural vegetation in order to maintain biodiversity and promote the ecological services provided by insectivorous bats.